Haiduk is brainchild of Luka Miloica, man with our roots, locate in Calgari, Alberta Canada.He is one-man band and on albums, he is responsible for everything. With one demo,he has released 4 items. Actual one, “Exomancer” from 2018 year, album with 10 tracks in, is death/black metal release, exploring eternity of cosmic darkness. Brutal riffs, dark atmosphere, repeatable hypnotic themes are here and there, from first to last tact of each songs. 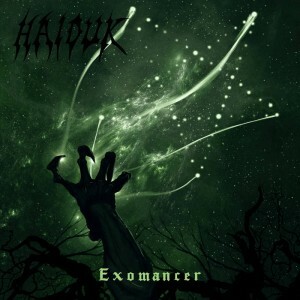 Even of late 90’s influences, “Exomancer” one more time confirm wide potentials of Haiduk, under the death/black variants. This is also album for old school followers of mentioned genre’s forms.